For most of us, winter has just started. And for some of those folks, winter has started with a bang, bringing plenty of snow & slush along even before the holidays. And this onrush of the white stuff tends to place people in two distinct camps: the LOVE IT or HATE IT crowds. One way to voice your affection or frustration for this time of year is via your phone or tablet’s wallpaper. Yes I know this isn’t the most aggressive way to show your colors but go with me on this. 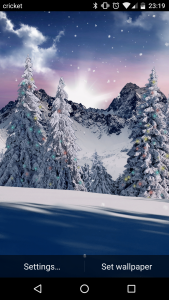 There are two wallpaper apps in the Google Play Store that can help you communicate your climate preferences: “Snowfall Day Night Christmas” and “Beach Palms 3D Live” wallpapers, from developer Bastion7, offers up family-friendly and rather high-quality wallpapers for your device….all for free (paid Pro versions are available – more on this in a bit). I need to emphasize that these are two separate apps, and both available for free in the Play Store; download Snowfall Day Night Christmas here, or if you wish, download Beach Palms 3D Live here. The two apps have some features in common. They both have very nice visuals, with great colors and realistic details. They also contain a great 3D effect, showing realistic depth between items in-scene. The 3D effect is also utilized while swiping between home screen panes. As the day progresses, a bright sun rises high above the horizon. As the day wanes, the sun dips low into a colorful sunset before retiring. At night a full moon slowly rises and casts a ghostly pall over the entire scene until morning when the sun beckons once again. Also, both apps extend to your device’s lock screen, offering the same visuals and interactivity there. The Snowfall app shows snowfall that blows laterally as you swipe. On the snow-encrusted evergreen trees, multi-color Christmas lights are aglow. 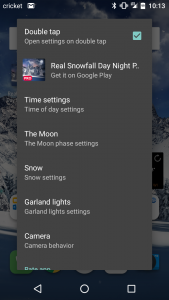 For settings in the free version, you can also adjust the amount of snowfall showing on your screen, as well as the intensity of the Christmas lights. 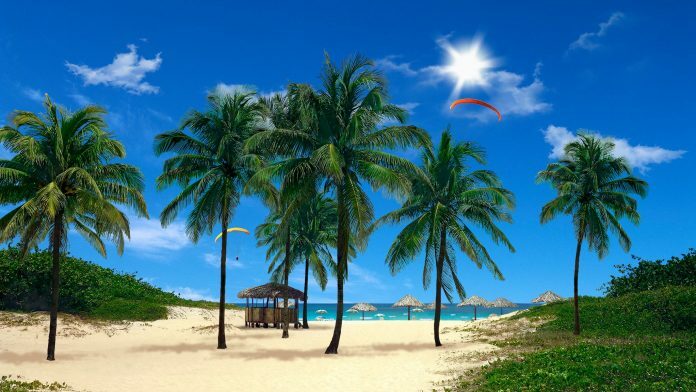 The Beach Palms app shows (wait for it) a tranquil tropical beach scene (see title image above). Palm trees waft in the breeze, and waves slowly crash into the sand in the background. During the daylight hours, a intermittent parachutist can be scene descending in the background. While at night, fireflies come out to play. A bonus in this app is a lonely cabana in the scene, that has a single light you can switch on and off with a tap on your screen. For free settings, you can turn the parachutists and palm tree animation on or off, as well as adjust the amount of fireflies on your screen. 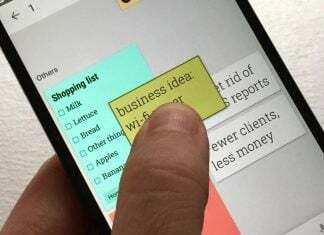 Both apps offer a Pro version, for $1.99 each. What your money buys you is the ability to further control the sun & moon: In Pro the sun’s height is governed by your exact location (using your device’s GPS), while the moon’s phase is also governed by your device’s location. Honestly I’m not at all convinced this added feature set validates the extra $2, but to each their own. My experience and therefore feelings for these apps is mixed. I must say both apps’ visuals were really pretty. As stated earlier, the colors were great, and I was truly impressed with the 3D quality of both. The settings are easy to access, with just a double-tap on your screen. Now here’s the bad news: On multiple occasions, I had the wallpaper “blackout” on me. 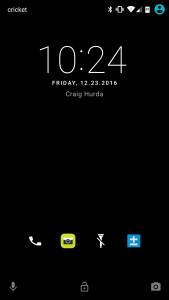 Meaning that upon waking up my device, both the lock screen and subsequent home screens showed only a black background; nothing to see at all. And it wasn’t temporary; this blackout effect didn’t go away without re-opening the app and re-setting the wallpaper. I’m not sure if this is a device-specific issue or it’s more widespread, but it definitely bears noting. That said, as long as you didn’t splurge for the GPS-based sun/moon effects, you’d wouldn’t be out much at all. So besides this hiccup, and if you’re willing to take this small blackout risk, I do actually have to recommend both Beach Palms 3D Live and Snowfall Day Night Christmas wallpapers. Each offers similar quality, while together they offer you a choice of specific environment (and weather mindset). Download Snowfall Day Night Christmas here. Download Beach Palms 3D Live here. 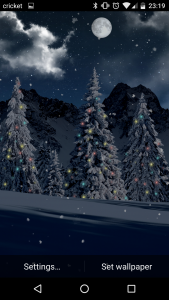 Both "Snowfall Day Night Christmas" and "Beach Palms 3D Live" wallpaper apps provide great visuals and pretty 3D looks. Limited settings and a experienced problem with intermittent 'blackouts' hampered the experience, but either is still a good free wallpaper to check out.